Who doesn't love toys!? Here you will find unique toys and gifts featuring your favorite Thomas the Tank Engine and his friends from the Island of Sodor. 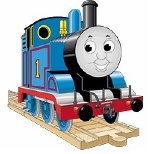 Add excitement and fun to your birthday party with the following Thomas the Tank Engine train toys and gift items. All Aboard!